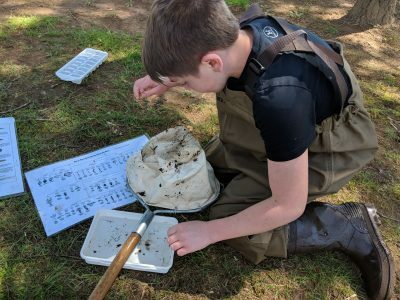 Macon County eighth graders got up close and personal with some of the flora and fauna in the Cullasaja River this week, as a group of environmental organizations led each eighth-grade class through the annual Kids in the Creek hydrological program. The program, which took place over four days at the Parker Meadows Complex, led students through four different stations to learn about different aspects of the river and the health of its complex ecosystem. Students studied the chemical makeup of water samples with researchers from the Coweeta Hydrologic Lab, captured and observed macroinvertebrates with staff from the U.S. Fish and Wildlife Service, learned about the fish that populate the river from Mainspring staff and took measurements of the river’s flow and the physics of the water with other Coweeta scientists. Getting kids outside and learning about the environment firsthand is a big benefit for students who might otherwise be disinterested in science, said Gary Peeples with the USFWS. Meador said he’s seen many students benefit from the program in the five years they’ve offered it, both in nurturing their budding interest in science and also just making them more comfortable interacting with the natural world. This year’s Kids in the Creek program received a boost from Rotary Club of Franklin Daybreak, with the volunteer organization donating $4,000 to support the programming at Parker Meadows. 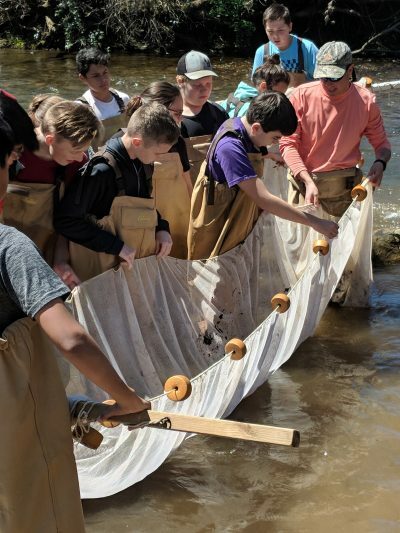 The funding provided several pairs of new waders, a new aquarium for students to use while studying the fish in the creek, funding for the scientists working the various stations and support staff to provide transportation and other necessary services to facilitate the program. Rotary representative Billi Black said the Kids in the Creek program provides an ideal opportunity for the club to fulfill their service goals.